ServiceMaster Restoration by Complete is based out of Staten Island in New York City and they have been serving Staten Island and Brooklyn, NY, as well as communities of Somerset and Middlesex counties in New Jersey since 2001. Each of the technicians of ServiceMaster Restoration by Complete have received IICRC certification in several areas including water damage restoration (WRT), mold remediation, and applied structural drying (ASD) and they use the best cleaning products and equipment available to fully restore homes and businesses that have sustained damage in a disaster. A fast reaction is important for limiting the damage after a disaster which is why ServiceMaster Restoration by Complete has a response time of 1-2 hours after the initial call. 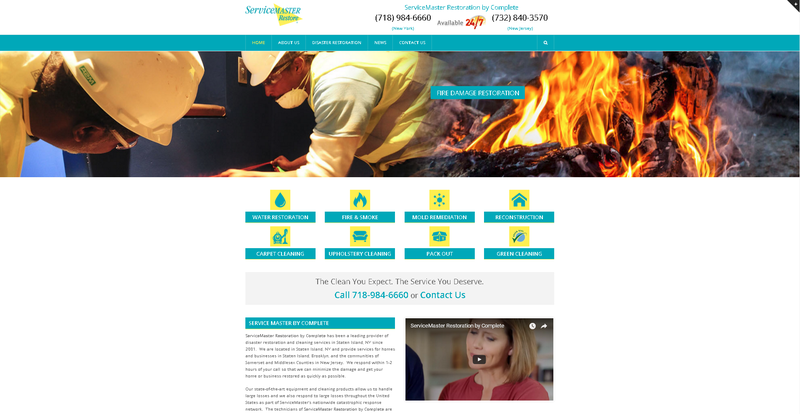 When ServiceMaster Restoration by Complete became a client, their website was not doing well in the search rankings, getting low search traffic, and had an outdated design that was not mobile friendly. Our web design team gave their website a completely new design with a more modern look and good mobile responsiveness. This new website was designed with SEO principles in mind such as improved navigation and mobile responsiveness to display correctly on any device to help improve the user experience. Users on mobile phones and tablets can easily navigate the entire website and even contact ServiceMaster Restoration by Complete right from their device. Each service page is highly optimized to attract more organic search traffic and there is a contact form on the right navigation menu on every page for the convenience of the user.